…such as paying more for IronPigs tickets? As we embark on the upcoming 10th anniversary of IronPigs baseball, the team has re-branded its season ticket plans as “membership plans.” And, I think I know why. First, let’s take a look at the “Membership Levels,” then we’ll discuss and react, and then a copy of the full press release will be included at the end. Reduced Parking Pass: This is more straight-forward pricing, and may actually be slightly less than previous offer. 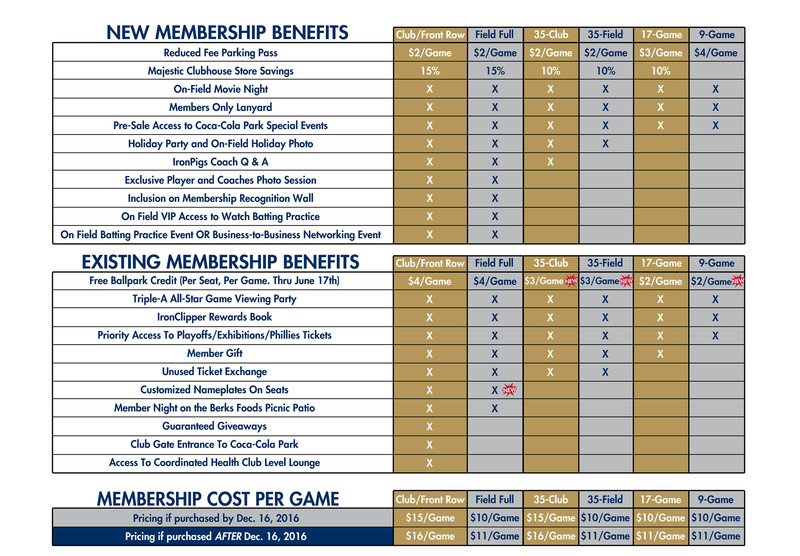 No mention of the 4-club-seat preferred pass, but I would imagine that will still be included at least through the end of our current contracts. Majestic Club Savings: We used to have a % on the back of our tickets, but that fell by the wayside this past season. This graduated percentage has “Kram” written all over it, though: It’s something I proposed back in 2010 when I started sending Dan articles to put here on the blog. I’ve proposed it several times since, too. Someone’s been doing their blog research I see. Member’s Only Lanyard: This was a given. Ever since I showed up for the 2016 season with a hole drilled in my season ticket card and wearing it on a lanyard so that I don’t lose it or have to fumble on my way up the steps–it was always going to be our season ticket gift for 2017. Holiday Party and Photo Op: A page out of the Phantoms book. Actually, suite holders have had a holiday party right along. It’s nice that us regular folk get one now, too. I missed the Phantoms one last season because I was out of town. I’ll look forward to this, though, as it’s nice to go over to the park in the off-season. Exclusive Player and Coach Photo Session: The event day the last couple seasons where the players are on the warning track and folks go around has been very well received. I’ve managed to miss it each time, but folks have told me they like it a great deal. I had suggested many years ago (as above) that STH get some exclusive access to the players. Many other teams do this; the Phantoms do a very good job with it. Just my opinion, but I think in the past the reason it wasn’t possible was that there were just SO MANY season ticket holders an event like this would have been difficult. Now, it’s more possible. It’s a nice addition, and something I think STH–err, “members”–want. Inclusion on Membership Wall: This similar to all of our names printed in the program? I appreciate the gesture, but not really necessary. As someone pointed out over on the Facebook STH group: There are some privacy concerns. Know I’m a season ticket holder so that you know when to go over to my house and rob all my stuff. Can we use pseudonyms? VIP Field Access for Batting Practice: This is a neat addition. I did enjoy the BP Parties of yesteryear out in the trough–and the kiddos always got a couple baseballs out of the deal. Those home runs were a bit of a safety hazard, so recently the pic nic patio nights replaced that perk (also a Noise Nation suggestion; seriously we should be commission on this stuff). Now, BP from on the field. Reading has this, called “cocktail party” because they provide drinks (soda, water, beer, wine) free during the event. Players come out to mingle while we watch the other team’s BP. I’m not sure how the IronPigs will do it–but I’m looking forward. Batting Practice Event OR Business Networking Event: I guess this is in ADDITION to above. And, I suppose a choice will be necessary. I know the suite holders get a “networking”-something occasionally. I’ll look forward to how this works. Ballpark Credit: The same for some of us–which is appreciated. However, some enhancements for 35 and 9-game plans. Membership Entrance. Club and Front Row get to use the West Gate, but others must wait in line with the masses. It really works well in Reading, and I’ve heard from field level “members” that they would really like and appreciate this–especially on giveaway days. It’s something to think about for season 11 if you don’t want to add it, IronPigs. Other perks appear to remain relatively unchanged. But what does “membership” cost? But, at least they didn’t try to use “membership” as a way to try to get us to pay the same rate for fewer games. Yes, it’s a lot. And, yes, if you have four club or front row seats and multiply by 72 (or 71 or 70) games and it’s a huge expenditure. However, take a look at what Hartford was asking (and they required at least a two-year commitment) and they couldn’t even manage to build their stadium in time for any 2016 games. In the IL, look at Nashville and Charlotte prices. Yes, bigger metropolitan areas, but we don’t have it so bad. (Allentown, Pa.) – In celebration of the upcoming 10th anniversary season, the IronPigs are debuting the brand-new Bacon, USA, Membership Program for the 2017 season — a year-round IronPigs experience pass featuring numerous new amenities such as savings on parking at games and at the Majestic Clubhouse Store at Coca-Cola Park, on-field VIP access to watch batting practice, access to an annual holiday party, an invitation to an exclusive player and coaches photo session and more. New and existing ticket plan holders can purchase or renew their Bacon, USA, Membership Plans beginning on Monday, August 29 at 10 a.m. by calling (610) 841-PIGS (7447) or by visiting the Coca-Cola Park ticket office during normal business hours (Monday–Friday, 9 a.m. to 5 p.m.; Saturday, 10 a.m. to 2 p.m.). 9-Game Bacon, USA, Membership Plans go on sale to existing customers beginning on Tuesday, Sept. 20 at 10 a.m. and new customers beginning on Thursday, Oct. 6 at 10 a.m. Renew or purchase your brand-new membership plan starting Monday at 10 a.m. and receive up to a total of $15 of Ballpark Credit for each seat in your plan redeemable for all remaining 2016 home games, including playoffs. Ballpark Credit can be redeemed for food, beverages or even merchandise at Coca-Cola Park. Ballpark Credit on each ticket in your membership through June 17, 2017 — Ballpark Credit is automatically loaded on to the barcode for each individual game in your plan and can be redeemed for food, beverages or merchandise at Coca-Cola Park). NEW: Pre-paid Parking Pass Savings – As low as just $2 per game depending on membership level. NEW: Majestic Clubhouse Store Savings – Up to 15% off depending on membership level. NEW: On-Field Movie Night – Available for all members. NEW: On-Field VIP Access to Watch Batting Practice – Get up-close and personal with future Major League stars on-field prior to select IronPigs home games. Available for Full Season members. NEW: Exclusive Players and Coaches Photo Session – Create a lasting memory with family, friends and clients with this new exclusive perk. Available for Full Season members. NEW: On-Field Batting Practice Experience or Business-to-Business Networking Event – Available for Full Season members. NEW: Holiday Party and On-Field Holiday Photo – Available for Full Season and 35-Game members. For a full list of new and existing Bacon, USA, Membership Plan amenities, click here. In total, there are more than twenty amenities and incentives for Bacon, USA, members. As an added bonus, purchase or renew a 1-year, 3-year or 5-year Bacon, USA, Membership Plan by Dec. 16, 2016 and enjoy loyalty pricing for the entire agreement length with single-game pricing remaining at $15 for Club Level and Front Row and $10 for Field Level. Renew or purchase a Bacon, USA, Membership Plan and pay in full by Dec. 31, 2016 and receive a complimentary IronPigs replica jersey giveaway for every seat in your plan (this offers excludes Nine-Game Membership Plans). Additionally, all five-year, full season commitments will receive a premium bonus gift. For just the second time in franchise history and for the first time since 2012, individual game ticket prices for the 2017 season will undergo a one dollar price increase across all pricing tiers at Coca-Cola Park with Club Level tickets being changed to $18, Field Level to $13 and General Admission to $10. All Membership Plans purchased after Dec. 16, 2016, will incur this price adjustment. 2017 single-game tickets will go on sale next March and fans can save $2 per ticket by purchasing in advance of the day of game. 71 regular season home games are scheduled for the 2017 season with the International League condensing the schedule from 144 to 142 total games. As a result of this adjustment, Bacon, USA, Membership Plans will be available in Full Season, 35-game, 17-game and 9-game plan increments. Existing plan holders up for renewal can expect to receive more information on these new Membership Plans via email in the coming days.